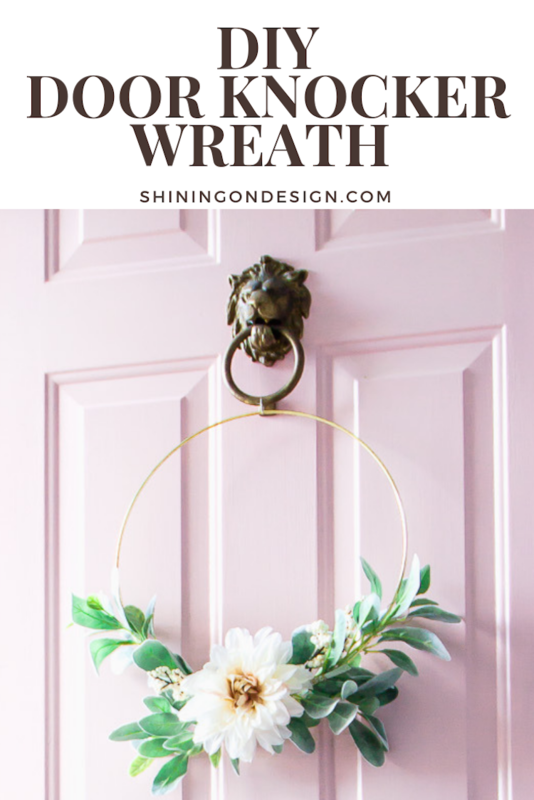 I envisioned what I wanted our seasonal wreath to look like but had no luck finding one ~ so I decided to make one! I’ve seen bloggers post about making these and I honestly just skimmed over them. I thought, I’ll just buy one (way easier, right?). I could not find one that I loved and was tired of looking. I wish I wouldn’t have waited so long! It really was so easy and definitely worth the effort. It took about 10 minutes to put together and can cost under $20 (depending on your florals and what you have on hand). You can even order most supplies from your couch. 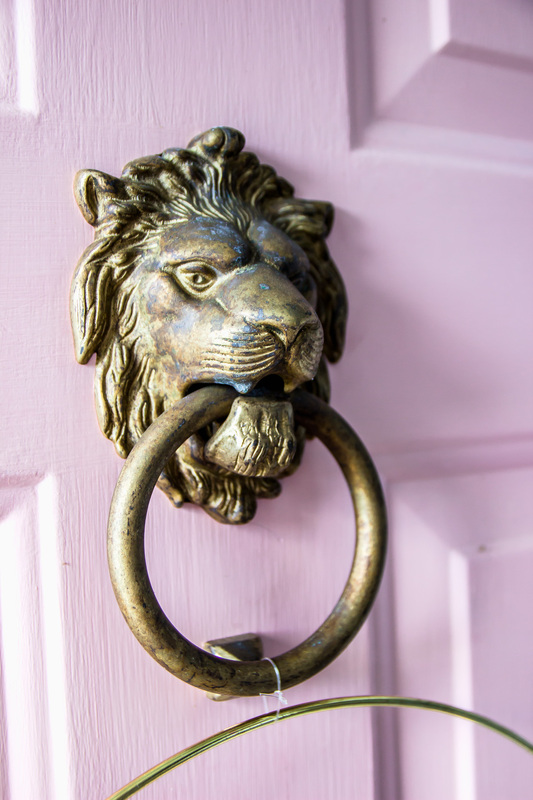 This is a great option if you have a door knocker that you want to highlight. Of course it can be hung differently (just skip step 3 if you aren’t hanging on your door knocker). Faux flowers (1-3 large is suggested, plus a smaller accent flower) – See step 1! I recommend selecting your flowers in person at a local craft store. This way you can (1) see how the colors look in person and (2) see how the colors of the large flowers, smaller flower and greenery look together. I lay them all out on the floor right on the spot. I even take a few steps back to see how they look from far away. 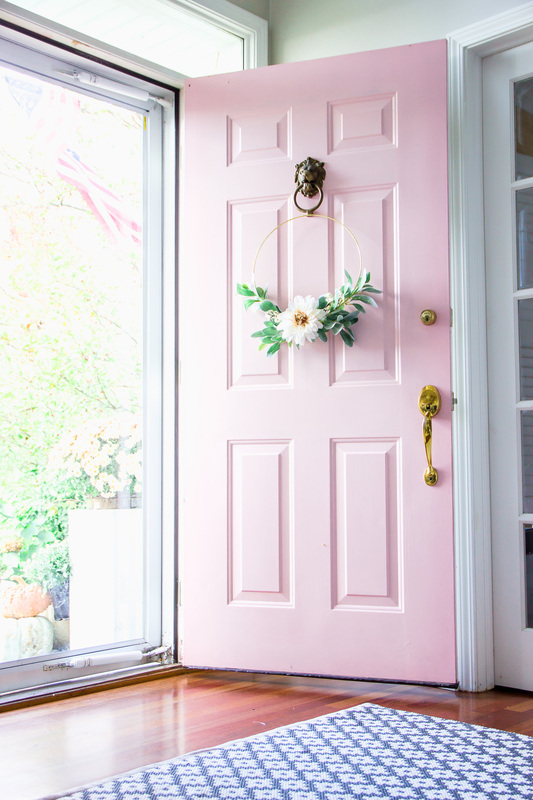 This may look goofy to people passing by but I think it’s important to see especially since most people view a wreath on the door from further away first. 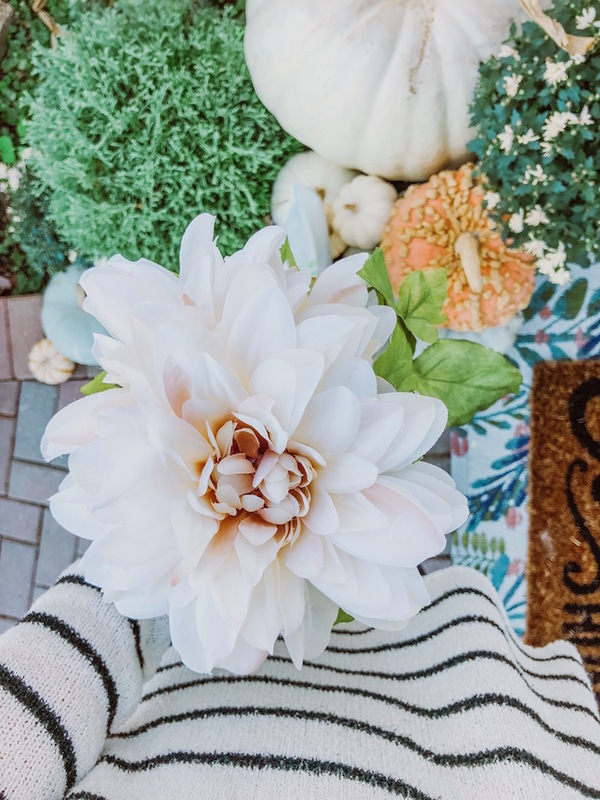 Once you have your flowers picked out and the other items on the shopping list, it’s time to put it all together! 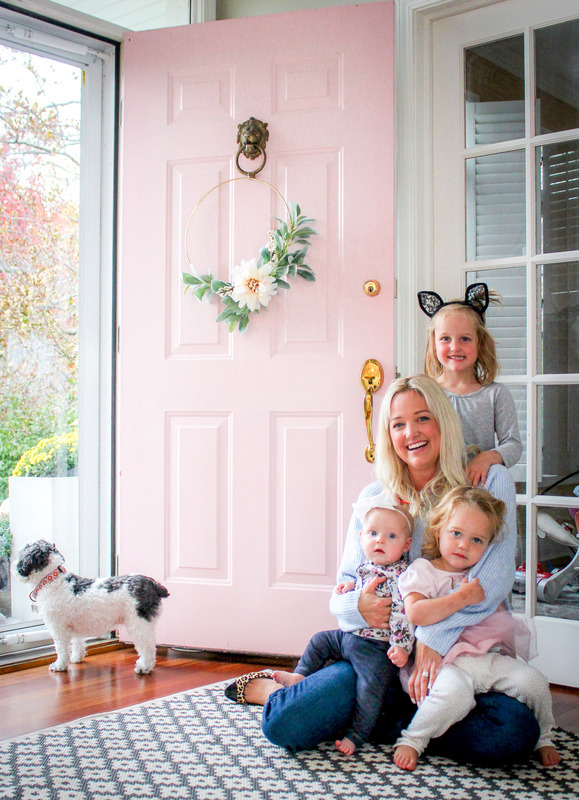 This only takes a few minutes which is one of the main reasons I love this DIY. Start with trimming the ends of the greenery and attach to the gold hoop with the floral wire. You basically just cut the wire and start twisting it until it stays on. I start at the bottom and don’t worry about seeing the wire too much since it’ll be covered. Then, add the accent flower and large flower with the floral wire. 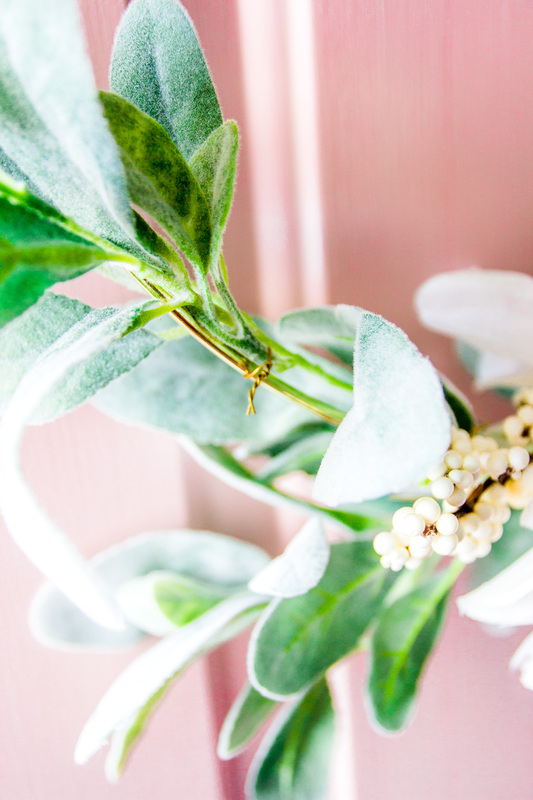 Depending on your greenery, you may need at add a little extra at the top. I had to do this a few times and readjust to get the look I was going for. 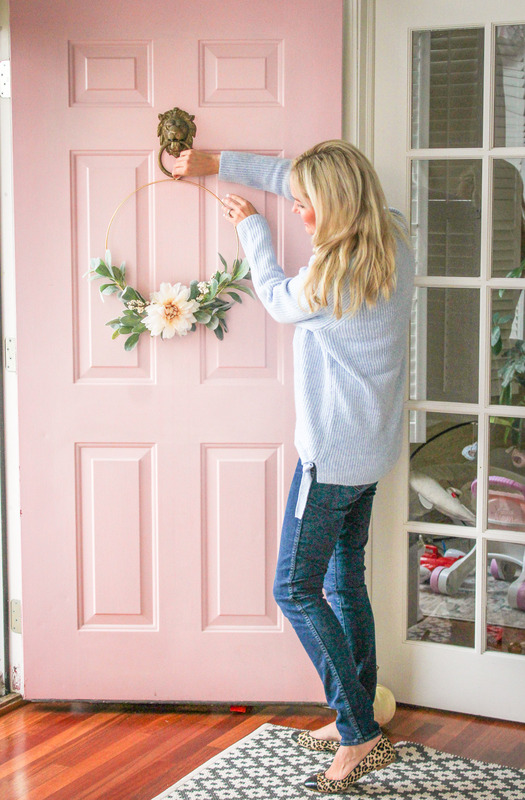 The secret to hanging the wreath with a door knocker is using a little fishing line! With the fishing line too, you can only tell if you go up really close and I trim it pretty well after tying it. I even like the wreath turned a little when hung. That was not done on purpose but with three little ladies in the house, you never know what things are going to look like haha! Learning to embrace it all. Hello Samantha. I enjoyed reading how easy and fun it can be to create our own wreath. And to add a personal and colourful touch to the traditional door knocker we have. Lovely photos! Samantha I love this wreath it turned out amazing!!!! You know I had the same issue finding an embroidery hoop too, I guess everyone bought them up! Don’t worry I have a feeling one will find you, because two week after I settled and made my wreath I found a glorious antique hoop which had to be 50 years old for $15 dollars at an antique store. When you quite looking is when you find them. LOL!! !